This site is currently under construction, please be aware that information is still being collected. The people of the Haida Nation have occupied and collected food and materials from Tlall since time immemorial. The Haida maintained villages and seasonal camps at nearby Dahua and Skaigha. The area supports a large variety and number of birds including sandhill crane and trumpeter swan. Several listed species also exist within this area including: two known Northern goshawk nesting areas, one recorded Northern saw-whet owl sighting, and marbled murrelets nesting habitat. 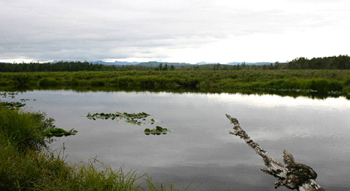 Tlall Heritage Site/Conservancy is located on the east side of Graham Island, Haida Gwaii, immediately south and east of the small community of Tlell. It is part of an archipelago-wide system of protected areas that includes Gwaii Haanas National Park Reserve and Haida Heritage Site, several provincial parks and ecological reserves, and ten other heritage site/conservancies. In total, half of the land base of Haida Gwaii is now in protected status. It is 20 kilometres northeast of Sandspit Airport. It includes a 350 hectare fen and marsh area known as the Tlell Pontoons and a large portion of the Tlell River watershed. The Tlell watershed flows north and east into Hecate Strait and consists of the Lella Creek, Feather Creek, Survey Creek and Three Mile creek tributaries. The heritage site/conservancy also contains segments of a number of popular interpretive hiking trails that wind their way through old burns, or old-growth Sitka spruce, western redcedar and western hemlock forests, and along the banks of the Tlell River. Two archaeological sites contain a number of recorded cultural values and at least 12 known culturally modified trees. Many of these areas have not been inventoried thoroughly which indicates that the conservancy may contain many other unrecorded cultural heritage and archaeological sites. This area is dominated by marine sandstone and volcanic rocks. The northern half of the conservancy/heritage site is made up of undivided sedimentary rocks. The Tlell watershed is made up of Lella Creek, Feather Creek, Survey Creek and Three Mile Creek tributaries. Survey Creek and Three Mile Creek are productive valley bottoms that are forested with old-growth Sitka spruce/Western hemlock and Western red cedar/Western hemlock forests ranging from 150 to 600 years of age. The Sitka spruce-devil’s club ecosystem, otherwise rare on Haida Gwaii, is extensive here. More than one third of the heritage site/conservancy consists of mature-seral forests that originated from fires in the mid-1800’s. These areas are the largest representation of younger Western red cedar (Thuja plicata) stands on Haida Gwaii and are unique in containing redcedar as a major species in stand composition. Over half of the conservancy/heritage site is old-growth forest (>250 yrs). There is also a stable Rocky Mountain elk (Cervus elaphus nelsoni) population that was introduced to the archipelago in 1929. Approximately 40-100 animals persist in the Tlell River watershed and may be observed in the pontoons area. 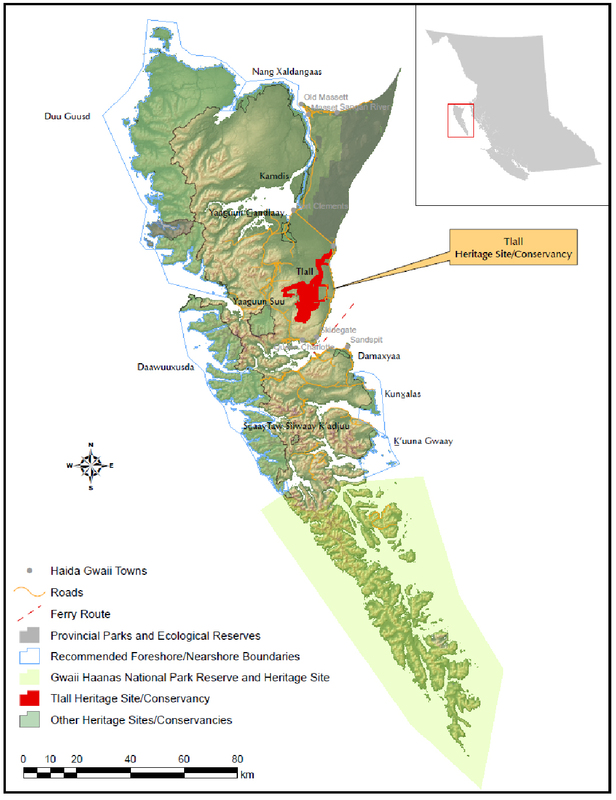 The management plan for Tlall Heritage Site/Conservancy was approved in 2011 by both BC Parks and the Haida Nation.